On October 1, Army engineers from South Korea began clearing the nearly one million landmines planted by South Korea-United States forces and the nearly 800,000 mines planted by North Korea in the Demilitarized Zone. Although it was announced that both sides would conduct the clearings, there was no immediate confirmation from the North that its troops had started the process. An additional demining project is also set to begin around the area called “Arrowhead Hill” (Hill 281), where some of the 1950-1953 war’s heaviest fighting for a strategic hilltop position took place; officials estimate that there are the remains of approximately 300 French, American, and South Korean soldiers in the area. The operation is a part of the agreement which came out of the recent summit between the two Korean leaders. The Korean Demilitarized Zone (DMZ) is a 155 mile long, 2.5 mile wide strip of land running across the Korean Peninsula. Similar to the fortified nature of Berlin Wall, the DMZ includes barbed wire, electric fencing, surveillance cameras, and landmines. In a statement, South Korea’s Ministry of National Defense stated that all landmines in the Joint Security area are to be removed within the next twenty days. The Joint Security Area (JSA) is the only portion of the Korean Demilitarized zone (DMZ) where the armed forces of the two Koreas stand face-to-face. Located near the village of Panmunjom, also called the Truce Village, the JSA is used by the two Koreas for diplomatic engagements. Prior to March 1991, the JSA was used for military negotiations between North Korean and the United Nations Command (UNC). Although South Korean troops have taken along most operations at the DMZ, the UNC retains a major role. Led by the United States, the UNC remains prominent at the JSA, where United Nations Command Security Battalion-JSA commander Lt. Col. Matthew S. Farmer and JSA Republic of Korea Army Battalion Commander Lt. Col. Young Hwan Kwon lead the security battalion. Many have asked if the UNC would also withdraw weapons from the JSA. UNC spokesman Colonel Chad Carroll stated that American forces would provide support for the demining process but did not confirm the removal of weapons. “United States Forces Korea will perform a support role – to include having air medical evacuation assets available to respond within minutes of any potential medical emergencies,” Carroll said. Even though the North and South are still technically at war (even though the conflict ended in an armistice sixty-five years ago and an official ending to the conflict requires support from China and the United States), relations have appeared to improve in 2018. In mid-September, North Korea’s Supreme Leader Kim Jong-un and South Korean President Moon Jae-in met in Pyongyang, North Korea, marking the third summit of 2018, the first being in April. Although the focus was initially on denuclearization negotiations, the September summit focused broadly on bringing peace to the Korean peninsula. “The fact that the leaders of Koreas can meet without limit in time or place symbolically demonstrates that a new age of inter-Korean relations has arrived,” said President Moon. The removal of landmines along the border and the retrieval of war remains are just two more steps in a deal attempting to ease relations. Since April, propaganda loudspeakers and some guard posts were dismantled from the border. In the seventeen page accord signed by both countries’ defense chiefs, they pledged to “remove all threats that can cause war from the entire Korean peninsula”. 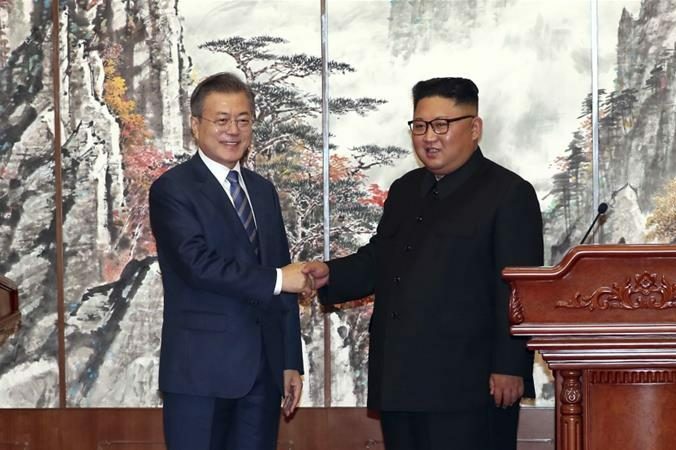 Pledges towards this goal included submitting a joint bid to host the 2032 Summer Olympics, removing guard posts in the DMZ, stopping military drills aiming at each other along the Military Demarcation Line, and creating road and rail links between the two Koreas. Although October marked the 70th anniversary of South Korea’s military, known as Armed Forces Day, President Moon’s decision to skip a military parade reflects his goal to ease tensions between the two Koreas. On October 1, President Moon attended a ceremony welcoming the remains of 64 South Korean soldiers from the Korean War home from Hawaii. The remains were collected by the United State’s Department of Defense POW/MIA Accounting Agency from battle sites in North Korea from 1996 to 2005; the search operations were suspended in the mid-2000s. At the historic June summit in Singapore, President Donald Trump and Kim agreed to recover Korean War remains and in July, North Korea returned the remains of fifty-five American troops killed during the conflict. Despite President Moon’s desire to make inter-Korea meetings an integral part of Korean relations, these steps towards peace do not completely secure permanent peace and stability. A major part of negotiations to end the war requires the United States. With the presence of American troops stationed in South Korea as a part of the two’s alliance, the United States’ military footprint and influence in South Korea is seen as a threat to the North. Now the ball is in America’s court to influence the future of this thawing Cold War vestige.